Say you were buying a car, and the used-car salesman told you that you could get a car with an accelerator, or brakes, but not both. Then he enthusiastically explained that really, you only need one or the other. I think most of us would opt for the bus. The word ‘conserve’ means to keep, protect, maintain. Conservatives seek to protect customs and traditions as they exist, or as they existed in the recent past. ‘Liberal’ means to be free; in this context it means to be free to change things, but the same stem feeds into ‘libertarian,’ which means to be free of government. Here’s my concern: too many people think you only need one, not the others. Conservatives are going to be right most of the time, simply because for the vast majority of life, we are all conservative. Most of the things we do, we do as our parents or grandparents did, and sometimes what people at the dawn of humanity did. We eat, sleep, dress, work, manage budgets, clean, cook, raise children. We manage relationships in our homes, with extended family, with coworkers and friends. For the past two hundred years, we have voted in elections, debated freely, and appealed to our courts for problems. Those may sound simplistic, but if I touch on contemporary topics it tends to spark a flame war. One of my goals with this blog is to promote open-minded dialogue and moderatism. My point here is, many liberals entirely miss the importance of continuity, and of intelligent, cautious change. They see a problem, see a possible solution, and they want resolution, immediately. With that approach, we have two problems: one, we don’t study the problem carefully, and design an effective solution; and two, radical change often creates more problems than it solves. On the other hand, liberals must be right at least some of the time, or we would never change, and we would not progress. Again, I don’t wish to touch on current, contentious debates and precipitate a stink fight. But there are few Americans today who think that women or African Americans should be excluded from full participation in our country. But when those ideas first appeared, conservative responses were, necessarily, to maintain the system as it was. I mentioned previously that I am a bleeding heart moderate. That is because both approaches — incautious change, and refusing to change — are not prudent. Worse, both approaches often hurt more us than they help. 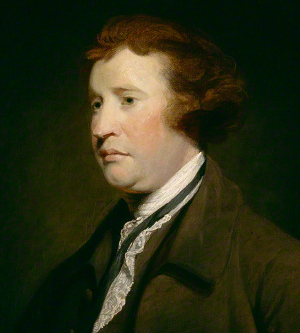 Conservatives claim their origins with Edmund Burke, who coined the very term ‘conservative.’ But it’s not that simple. Burke supported the American Revolution, which didn’t win him too many fans in the ‘conservative’ English aristocracy. The rebirth of democracy was a decidedly radical event, and many of Burke’s contemporaries did not approve, not of us, nor of Burke’s ideas. On the other hand, Burke disapproved of the French Revolution, and predicted it would be a disaster, which it was. That prediction, in fact, is part of Burke’s enduring attraction as a subject of study. Philosophers have a hard time with Burke, and part of that is because he has no ‘GUT’ – no ‘Grand Unifying Theory’. He was an eloquent speaker and writer, but he did not operate from a single philosophical standpoint. I previously mentioned that to a hammer, the whole world looks like a nail. If Burke had heard that metaphor, I think he would have insisted that he was a toolbox. So philosophically, he was not neat, he was inconsistent. One of Burke’s most important arguments was that governance, and statesmanship, are skills, no different than any other; they require years of study and practice. This is a valuable caution as we implement term limits, and work to elect ‘outsiders’ to public office. We assume that newcomers and outsiders will do things in a different way. They most definitely will, but there is a very good chance that without experience, they will be ineffective at best, and dangerous at worst. It’s an interesting irony: when arguing for term limits and outsiders, the electorate – typically conservatives — is basically saying, “I want change, and I want it now.” So ironically, these conservative approaches to removing the status quo resemble my concerns about liberals. As I noted before, if you go far enough to the right or left, you enter a rabbit hole and end up on the other side. My main point is that by today’s standards, Burkean conservatism was neither conservative or liberal; it was simply open-minded pragmatism. Only since then have conservatism and liberalism tended to square off into absolutist, closed-minded approaches. The answer to our problems is not conservative, it is not liberal. The answer is both, and the dialogue, even the dance, between them. The problem we have today is that there can be no dialogue if no one listens. I recently read a book that mentioned the thought of liberalism as a sin—-yes it was Catholic, but mentioned that its start was in the Protestant reformation. This gave people the freedom of private interpretation and ergo their own religion as they interpreted Biblical writings—-So just as our president uses executive orders to get around the constitution, it started with the free will of private interpretation! Well, the Church is like the rest of us. They threatened Galileo and kept him under house arrest until the end of his life, because the idea that the Earth orbited the Sun violated Biblical teaching at that time. But 400 years later, Catholicism proposes the Big Bang Theory (cosmological inflation, not sitcom) as a radical idea to support religious doctrine. We all change, all the time. By definition, change is not conservative.